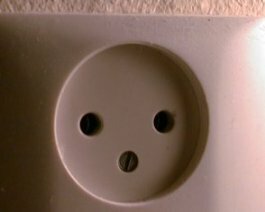 As power plugs and sockets differ to a large extent between countries, this may be a Dutch problem. 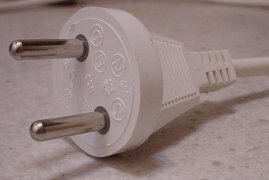 Not so long ago only power sockets in kitchens and bathrooms had to have an earth connection. 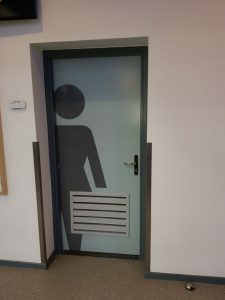 In all other rooms sockets without earthing were installed. 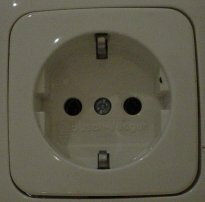 In these rooms you’d use equipment with a plug without earthing, as shown below (the old plug). 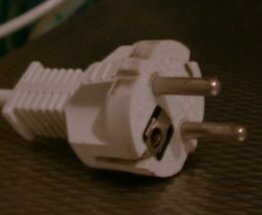 The stupid thing is that the old plug (connected to equipment that does not require earthing) does not fit into the socket with earthing, while an earthed plug (which requires earthing) fits without problem into the old socket. 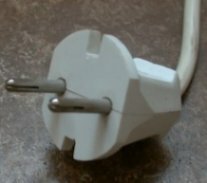 What happened is that people filed the old plug to fit the socket with earthing (left hand example below). 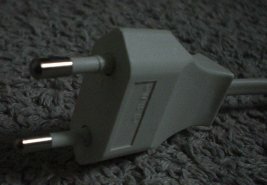 Nowadays, the so-called Euro-plug is common that is supposed to fit into most European power sockets (right hand photo below).